Random thoughts on this and that. Complete limerick archive from "Abated Breath" to "Zero Risk." More wit & whimsy from the author of Politickles. 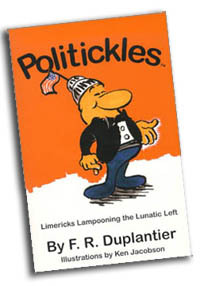 "Your Weekly Politickle" has been provided free of charge to email subscribers since 1997! And free it will remain. A few years ago, however, I initiated an appeal for self-imposed subscription fees (i.e., donations). Please determine the amount you wish to contribute, if any, and make a Paypal donation online by clicking the "Make a Donation" button below. FAQs: How much should you donate? Again, that's for you to decide. It depends on how much you like, and value, "Your Weekly Politickle." For a one-year (52-week) subscription, for instance, you might contribute $5.20 (10 cents a laugh). Must you contribute in order to continue receiving "Your Weekly Politickle"? Of course not. It's voluntary, remember? Must you contribute in order to terminate your subscription? Again, no. (But that's an interesting idea.) Are donations tax deductible? Afraid not. Politickles.com is a no-profit, not a non-profit, organization.